Gain strategic focus BEFORE you plan. Based on the Strategic Focus: The Art of Strategic Thinking, Cecilia will guide you through the four core elements that shift your thinking to a strategic thinking mindset. Every Wednesday 10:00 - 11:00 PST for six weeks. This is a live instructor-led online course with off-line exercises and approximately 60 minutes live online meetings once a week for 6 weeks at 10:00 AM PST. 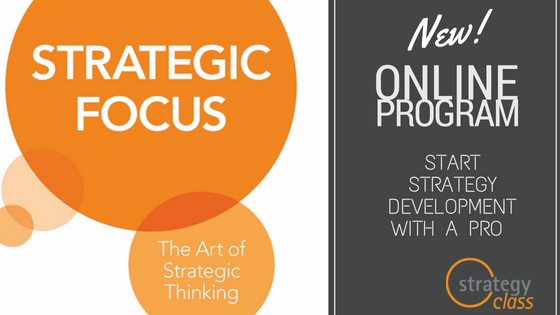 This course is designed for entrepreneurs or company executives to acquire new strategic thinking skills and significantly improve the performance of the next planning effort. "I wasn’t sure exactly where I was going with my business, who I wanted to target, what I offered that other companies didn’t; I got real direction and feedback from Strategy Class, not only from Cecilia but the other brilliant entrepreneurs that I took the class with." "Wow, wow, wow. I feel so much more confident to discuss what I can do with current and new partners after completing Strategy Class with Cecilia. Thank you so much." "Working with Cecilia has really helped me to identify my clients and helped me to focus on defining myself, my services and my company to them. She has been invaluable in opening up possibilities for me to build and grow in ways that naturally gets me to my goals. Being in a small class environment allowed the added perspective of other brilliant people adding to the strategizing. Fantastic!" Programs included in Focused Momentum® OnDemand offerings are not eligible for substitution, transfer, cancellation, return, or refund. At Focused Momentum®, we guarantee the quality of our seminars. If, for any reason, you are not satisfied with a seminar for which you have paid, Focused Momentum® will give you credit toward another seminar of comparable price. Focused Momentum® provides two online payment options for your convenience. Pay online with a credit card: You can bill the seminar to a corporate or personal credit card. Payment offline through an invoice: Focused Momentum® will send a bill directly to you or your company. Please note that some companies may require a purchase order be completed before they process an invoice. Please contact us at if you would like to be invoiced. If you would like to inquire about an alternative payment option, please contact us.